The Santhals of Jhargram are born dancers and singers. Their songs and music are joyous and depict the festive spirit that prevails whenever there is an occasion for people to get together. The indigenous musical instruments and the traditional tribal costumes and jewellery worn by the dancers, add to the beauty of the dance.The Santhal dance is considered to be one of the best tribal folk dances of India, which offers immense vibrancy and cheerfulness. 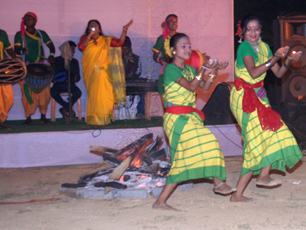 Thel dance is generally performed by both the men and women of the Santhali tribe. Raibenshe is a genre of Indian folk martial dance performed by male only and this dance was once very popular in West Bengal. 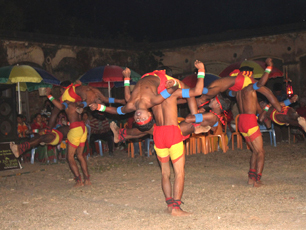 Traditionally, this dance involves vigorous and manly movements of the body along with the acrobatics of a raibansh (a long bamboo stick), from which its name originated. During the performance, the performers enact the actions of drawing a bow, throwing a spear and waving a sword. The performers wear a brass anklet (nupur) on their right ankle. It is accompanied by dhols (drums) and Kanshis (cymbals). It was traditionally performed by Bagdi community, who worked as the bodyguards of the landlords in medieval Bengal. It has a special gharana as it descends from Chotanagpur Plateau. 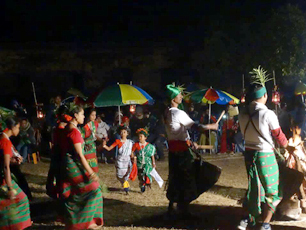 The dance is mostly performed in open places (now-a-days in cultural gatherings also). The male members wear long traditional dresses and keep the rhythm with few traditional instruments generally a drum, hung on shoulder; a flute and a pair of "Taal" (two metallic discs). The girls mostly perform the dancing part, holding each other's waist and movnig hands and legs forward and backward synchronously. The lyrics of Jhumur are built on day-to-day languages and mostly depict love and or pleasures and pains of day-to-day life.